Hi! Come on in and visit for awhile. Gee, it's good to see you. This website discusses alcoholic beverages in a positive manner which may be objectionable to some adults and which is generally considered inappropriate for people not yet old enough to legally consume alcohol. The internet is an international venue, and discussion of the subjects herein may also be illegal in your nation or area. We do not wish to offend, so if any of the above applies to you, please do not proceed any further. Linda and John do not condone abuse of alcoholic beverages. and respect only those who know how much they can... and cannot... safely consume. 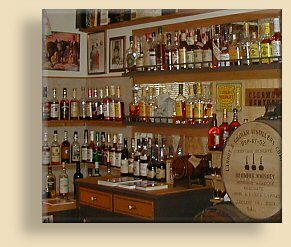 American Whiskey, and how it got to be this way Bourbon, Rye, Tennessee, Corn, Straight, Blended, Sour Mash, or Moonshine, the history of American whiskey is the history of America itself, and vice versa. American Rum The beverage of choice in the Colonies, a major industry destroyed by the American Revolution and the collapse of the Triangle (slave) Trade at the end of the 18th century. A renaissance of American rum is beginning in the 21st century and here a some of the forerunners of its renewal. Please Understand: Except as noted, these distillery visits are somewhat historical in their own right. Some were taken nearly twenty years ago. Some just last month. We have intentionally avoided trying to keep our descriptions up to date. You can easily find the current state of each distillery on their own websites or Facebook pages (many did not have websites when these visits were first made!) The date of each visit is part of the title and we hope you will consider any historic inaccuracies as part of the nostalgia of the American spirits industry. Site copyright �1996-2016 by John Lipman. All rights reserved.